The xDrive40e isn't so much the "green" pick as it's a good step up from base before broaching the $73,000 V-8 version. 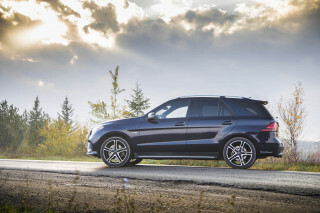 We expect there'll be another permutation of a crossover-coupe-SUV-sedan-wagon to charge out of Munich by the time we're done with this story. The X5's exterior sheet metal has definitely aged, but not poorly. Inside, the X5 shines and we'll give you the highlights: good dash, great materials, beautiful infotainment, and better outward visibility. Under the hood, a potent, corporate turbocharged 3.0-liter inline-6 awaits for base model buyers. 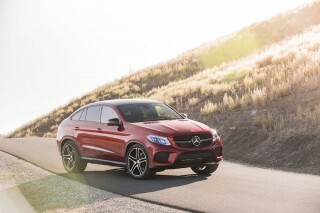 Its 300 horsepower and 300 pound-feet of twist are plenty in rear- or all-wheel-drive configuration. We haven't spent much time behind the wheel of that model, but we can't imagine its 6-second run up to 60 mph will leave many buyers wanting more power. The next engine up is actually two cylinders down. A plug-in hybrid xDrive40e marries a 2.0-liter turbo-4 to batteries for a net output of 308 hp. All-electric range is a not-very-impressive 14 miles, and the system combines for a 58 mpge rating (or 24 mpg combined on gas alone). As far as hybrids go, the all-wheel-drive X5 xDrive40e isn't much to write home to the folks about, but as far as SUVs go, it's still one of the best. 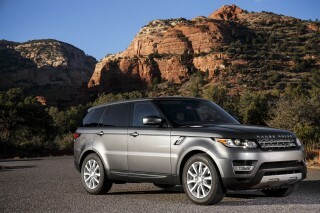 A 4.4-liter turbocharged V-8 sits atop the range and packs a wallop. At 445 hp, the big V-8 charges forward with aplomb: 60 mph comes up in 4.7 seconds. 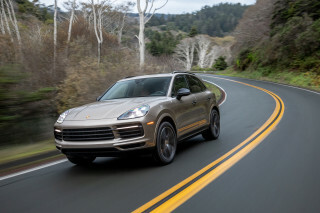 Not many SUVs do so much with so much—short of the X5 M, but more on that in a second—but we suspect that engine will be selected by buyers seeking its interior refinements more than its brute capability. We consider the X5 M to be its own mountain top. The twin-turbo V-8 spins out 567 hp and 553 lb-ft. Its initial gearing is taller because you didn't need all that rubber on those tires anyway, and it gets special M treatment: special oil pumps operate at higher g forces, modified upper wishbones increase camber for better turn-in, a 10 mm drop in ride height to mitigate substantial body roll, and standard rear air suspension delays the Cheerios that'll likely get sprayed all over the back seat during a spirited grocery run. All X5s sport an 8-speed autobox that keeps every engine in check, and the transmission does its best to rest the X5's chin on roughly 20 mpg combined in nearly every configuration. A hard-to-find diesel model does better, 25 mpg combined, but again: hard to find. The BMW X5 can seat up to seven, but its third row isn't accessible or comfortable for anyone who's finished the third grade recently. With 23 cubic feet of cargo space with the seats up—66 with the seats down—it may not be as capacious as an X3, but the X5 is reasonably versatile for families and their gear. The X5 has good marks from national safety rating agencies with five stars from the feds and "Good" ratings from the IIHS in the tests it has performed. (It hasn't yet been rated in the small-overlap crash test.) Equipped with optional safety gear, the X5 can stop, go, and help steer itself. But it's that operative word "optional" that irks us and keeps it from scoring higher on our ratings system. 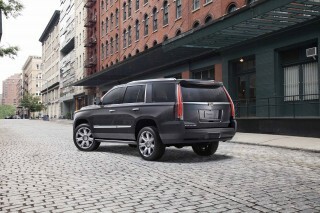 A rearview camera is $400 more on an SUV that starts north of $55,000. We can't even. Like any good BMW, the options are there for the picking—and they're ripe. A supreme Bang & Olufsen sound system can replace the standard nine-speaker affair (or the 16-speaker Harman Kardon system on xDrive50i models). Rear entertainment screens can be added to aid parents' sanity on long drives. Oh, and those two alone add about $6,000 to the bottom line. As standard, the X5 is luxurious and well-equipped—not many luxury cars offer a standard power adjustable steering wheel or 14-way adjustable seats. A light touch with options can keep an X5 close to reality and we think that's the best route. The X5 is best considered inside its cabin; the exterior has manners, but doesn't rise above average. The current X5 is a softer approach to SUVs than its ancestors. The latest X3 shows up as an influence in the larger SUV's profile, and BMW's sedans show up in its front end. The combination of a tapered roofline and lower window line give the X5 a little wagon-esque appearance, we say. 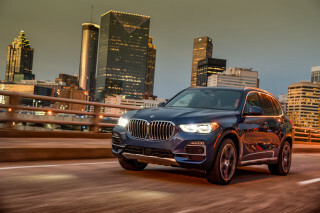 Along its sheet metal, the X5's side stampings visually take off some of the weight from its haunches and its character line draws all the way around to LED taillights that inject some wedge into its shape. The front three-quarters are a little muddled. Its sharp nose lines look a little overwrought and the kidney grille with chrome surrounds distracts attention from well placed headlights (that can be swapped out for all-LED units). Inside, the X5 is instantly recognizable to anyone who's driven a modern BMW. The horizontal shelf layout and driver-centric cockpit is bright and clean, a far cry from older BMWs and their stark seas of black. Two interior themes can be ordered as an upgrade to the standard poplar wood trim and black leatherette upholstery: Ivory White Nappa leather matches up with oak or other wood trims, while the Mocha look gets Nappa leather in that color and black Nappa leather on the dash, with contrasting wood trim. Dakota leather upholstery is standard on the xDrive50i and available on the other models. The X5 can be finagled with any of three trim lines. Luxury Line X5s have more bright metallic flourishes, while the xLine gets a blacked-out grille and under-mirror trim, with bright window sills. The M Sport adds a body kit, Shadowline trim, and high-gloss roof rails, as well as bigger wheels. The X5 isn't short on power anywhere in the lineup; a turbodiesel may come back this year. The lineup starts with the familiar corporate turbocharged inline-6 that makes 300 horsepower and 300 pound-feet of torque. 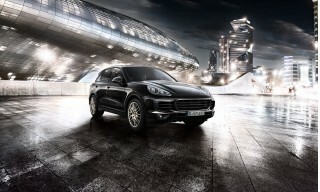 Offered in either rear- or all-wheel-drive configuration, the engine's torque peaks at 1,200 rpm to 5,000 rpm. According to BMW, the inline-6 charges up to 60 mph in just over six seconds, which is very swift for the 4,700-pound hauler. We haven't spent much time behind the wheel of versions equipped with the inline-6, but based on our experiences with that engine in other places, we can't imagine dissatisfaction with that powertrain. Stepping up to the twin-turbocharged 4.4-liter V-8 brings a profound surge of Bavarian brawn by way of the American South. The twin-turbocharged V-8 rips off 445 hp and 480 lb-ft of torque and runs up to 60 mph in just 4.7 seconds. The actual speed isn't as thrilling as it sounds on paper: The X5 xDrive50i has standard all-wheel drive, adjustable suspension, and an 8-speed automatic that works in concert with enough sound deadening to muffle an arena. It's undramatic and somewhat civilized speed, we say. The X5 M gets an uprated V-8 that makes 567 hp and 553 lb-ft of torque. It's predictably savage and runs up to 60 mph in four seconds. It gets its own goodies including a beefier oil pump, roll bars and stabilizers, suspension components dialed in for more camber, and standard rear air suspension. It gets a similar number of forward cogs, but taller gearing for quicker takeoffs. We love capitalism too. The plug-in hybrid version, which was new last year, features BMW's turbocharged 2.0-liter inline-4, an electric motor packaged within the 8-speed automatic, and a 9.2-kwh lithium-ion battery pack that can be charged in less than three hours on a Level 2 charger. Its total output is 308 hp and 332 lb-ft, and BMW quotes a 0-60 mph time in 6.5 seconds. On electricity alone, the X5 xDrive40e can travel roughly 14 miles. The behavior of the hybrid system—and how much the gasoline engine stays off—depends both on the settings you select and how you drive the X5. In the MAX eDrive setting, the X5 is powered only by electric power except if you floor the accelerator; in this mode, speed is limited to 75 mph. Otherwise there's an AUTO eDrive setting that allows the gasoline engine to come on more often and at a lower speed (of around 45 mph). A turbodiesel inline-6 is available, but tough to find. It produces 255 hp and 413 lb-ft of torque. Its long legs and smooth shifts make it our pick for long-distance cruising, but it was a late addition to the lineup and could be tough to spot on dealers' lots. All X5s are equipped with an 8-speed automatic with paddle shift controls. The transmission is part of the suite of controls that are affected when the driver chooses Eco Pro mode on a console-mounted switch. Eco Pro mode slows down throttle response, triggers earlier upshifts into the 8-speed's more economical gears, and lets the X5 coast under some conditions by decoupling the engine; it even chooses some navigation routes for the optimum fuel efficiency. The electric power steering fitted into all X5s follows suit with the rest of BMW lineup. In Eco Pro and Comfort modes, the steering doesn't offer much by way of feedback, and dithers on-center. Dialing the steering up into Sport and Sport+ modes delivers a meaty feel that's become common to most BMWs: pause the wheel at a point midway through a corner, and there's immediate buildup, a wall of return force to climb as you unwind it. With the available Active Steering, the ratio varies as speeds and cornering forces build. It can be an unwelcome variable in sports cars, but in sport 'utes like the X5, it's more useful, making size and overall length less of a liability when parking or driving in town. The xDrive all-wheel drive system provides a variable torque split front to back, not to mention interaction with traction, stability, and hill-descent control systems. If you're truly planning to take the X5 off-road, xDrive will show how it apportions power on the big LCD screen atop the center console. We climbed some moderately challenging lumps on the trails surrounding Vancouver 2010's ski jumps, and slogged through some mud without a misstep. It's more in the Ford Explorer/Volkswagen Touareg camp of light off-road capability than in the Range Rover Sport take-no-prisoners talent pool, but the X5 should have no problem making it to a remote-ish cabin in the woods. The techno feel of the rack flows through to the X5's strut and control-arm independent suspension, which in most cases and configurations, gets augmented by adaptive dampers and rear air springs. Dynamic Damper Control puts automatically adjusting shocks at the corners; they're set to work in concert with the steering, throttle, and transmission, through the same Eco Pro, Comfort, Sport, and Sport+ modes. Adaptive shocks give the X5 a constant sense of stability. We haven't driven an X5 with the non-adaptive suspension, but with this vehicle's mass and performance capability, the adaptive suspension is likely to be the preferred setup and it should also include the add-on self-leveling rear air springs. These features make the X5 a resolutely flat handler in corners, not entirely forgiving with its ride quality but only truly harsh with the biggest wheels in the most aggressively controlled modes. If you're truly using the X5 just as a commuting vehicle, you may never encounter any instance so exotic as to need the upgraded Dynamic Performance Control setup, but like other similar systems, it lets the X5 vary the torque split between the rear wheels, to let it turn in more crisply and change lanes more cleanly. The BMW X5 can fit up to seven in its friendly confines, but we think it's better suited for up to 5. The stylish cockpit is shod with poplar trim as standard, which can be upgraded to tasteful swathes of aluminum or rich wood. BMW's passable faux-leather, dubbed SensaTec, is standard, however well-heeled buyers can opt for better hides, including a deep mocha shade or shocking ivory white ($1,950 options). We say go brown, or go home. Front-seat passengers get the best view in the house. BMW's big, colorful 10.2-inch iDrive display is crisp and has been upgraded this year to include a touchscreen. Power 14-way adjustable seats are standard, but can be upgraded to 20-way adjustable seats or deeper sport buckets. There's enough adjustment in all the seats to fit myriad body types, but we've noticed that without the optional cooling seat ventilators, the bottoms are a little flatter and less comfortable. The driver and front seat passenger are split by a wide console with plenty of storage for phones, keys, and cups. The second row's basic setup is a 40/20/40-split folding affair, that's wide enough for five adults—but four will be happier. With the standard panoramic sunroof, there's little headroom left for 6-footers until the seats are reclined. Behind that second-row seat is about 23 cubic feet of space, which you can choose to fill with a fold-away third-row seat. It's as small and unwelcoming to adults as the third-row seats in a Dodge Journey, and tough for anyone to step into who is not into Garanimals. The saving grace is the seat folds away in portions, and flattens out of the way along with the second-row seat for up to 66 cubic feet of cargo space. The X5's tailgate is power-operated, and it's kept its unique tailgate/liftgate setup: the lower section drops like a pickup, the top section powers open and closed like a pricey minivan. The BMW X5 has good crash data and accessible safety options, but the lack of a standard rearview camera spoils it a little. The 2017 BMW X5 comes standard with an impressive roster of safety features, and the big SUV offers a very good menu of available safety accessories. All X5s sport a standard complement of air bags, stability control systems, and parking assistants. Most X5 models don't get a rearview camera as standard (only the xDrive50i does) despite its high price. Federal testers have given the 2017 model a five-star overall rating, with only a four-star rollover safety score, which is fairly common for SUVs. The IIHS hasn't yet run the X5 through its comprehensive list of crash tests, although the agency has given it top "Good" scores for side impact protection and moderate front overlap protection. When optionally equipped, the X5 earns a "Superior" rating for front crash prevention. Outward visibility in the X5 is excellent, and a surround-view camera system and optional tech help the lumbering hauler slide in and out of parking spaces or stay safe on dark roads. BMW's Parking Assistant takes the wheel when it's ordered. It can steer the vehicle into parallel spots or perpendicular ones at the touch of a button. The same underlying technology couples with adaptive cruise control to bring you Traffic Jam Assistant, which maintains following distance all on its own in heavy traffic, and keeps the vehicle at the center of its lane by providing steering input. Night vision and a head-up display remain on offer, and the X5 can be fitted with full LED lighting. Finally, BMW's assistance plans include basic coverage that heightens its automatic-collision alerts to emergency services, based on the vehicle's position, airbag state and speed before impact. It also provides real-time traffic information. The X5 is very well equipped as standard; a heavy hand on options can add more than $30,000 to the bottom line. Getting what you paid for doesn't always have to be a penalty. The base X5 comes equipped with 19-inch wheels, adaptive xenon headlights, 14-way power adjustable and heated front seats, wood trim, a power adjustable steering wheel, Bluetooth connectivity, adaptive cruise control, navigation with traffic info, panoramic moonroof, power tailgate, rain-sensing wipers, BMW telematics and remote services (such as unlocking the car via an app), and a nine-speaker stereo with HD radio. Like last year, a rearview camera is a $400 option, any color other than white or gray is a $550 additional cost, and leather upholstery costs $1,450 at minimum, for the sDrive35i and xDrive35i. Most would think these features would be standard given the price tag. If you want all-wheel drive, you'll need to step up into the X5 xDrive35i, which is priced at nearly $59,000 and is equipped nearly identically. The plug-in hybrid X5 xDrive40e adds as standard adjustable dampers with rear air suspension (a $1,500 option elsewhere) and a separate driving dynamics control system that includes EcoPro modes and various levels of battery-saving features. It starts at just over $63,000. The V-8-equipped X5 xDrive50i comes loaded with a few more goodies. For just over $73,000 to start, the V-8 adds 20-way adjustable front seats, leather upholstery, a standard rearview camera, keyless ignition, a 16-speaker Harman Kardon premium stereo, and more metallic paint swatches to choose from as standard equipment. 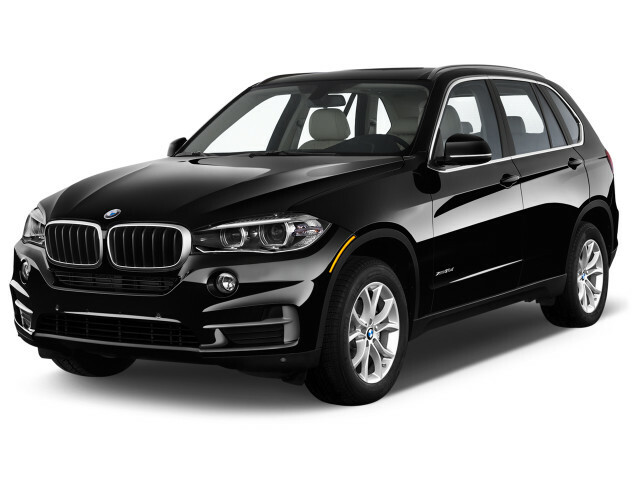 The X5 can be ordered in one of three trim packages, Luxury, xLine, and M Sport. Luxury Line and xLine packages bring more personalization, with coordinated interior trims that are a step more attention-getting. The xLine features satin aluminum and high-gloss finishes, while the Luxury Package gets blacked-out grille chrome strips and some sporty cues. The M Sport adds a body kit, Shadowline trim, high-gloss roof rails, sport seats, an anthracite headliner, and various other high-performance cues as well as an option for an M Adaptive suspension. 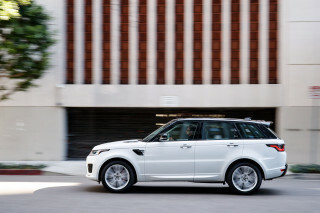 Stand-alone options include active steering (except on sDrive); the active air suspension; a nappa-leather dashboard; four-zone climate control; adaptive cruise control with stop-and-go capability; parking assist; a Harman Kardon audio system or a $3,700 Bang & Olufsen setup; night vision; and a rear-seat entertainment system. Big 20-inch wheels with summer tires are also optional. A heavy hand with the options list can add more than $30,000 to the bottom line of an X5, which is about the price of a new 2-Series. Last year, BMW added a plug-in hybrid X5, but fuel economy is still fairly low for the heavy SUV. The 2017 BMW X5 comes in a range of powertrains from an inline-6 and a V-8 to a plug-in hybrid with a small inline-4. A turbodiesel model was available last year, but officials from BMW said that model isn't yet available for 2017 due to additional testing by federal regulators. Testing isn't yet complete for 2017, but considering its similarities to last year's model, we can confidently carry over those numbers. We'll update this space once we hear more from the EPA. The base rear-drive X5 sDrive35i was rated for 2016 at 18 mpg city, 25 highway, 21 combined. Adding all-wheel drive, which BMW calls "xDrive" drops those ratings only slightly to 18/24/20 mpg. Opting for the 4.4-liter twin-turbocharged V-8 predictably sinks those ratings to 15/21/17 mpg. New last year, BMW offered the X5 with an optional plug-in hybrid powertrain. That model, called the X5 xDrive40e, managed a 24 mpg combined rating when using gasoline and a 56 mpge rating when electric and gas operations are combined. The EPA gave it a 14-mile EV rating and we observed a 24-mpg combined average through 380 miles of testing—including 30 miles of city driving. 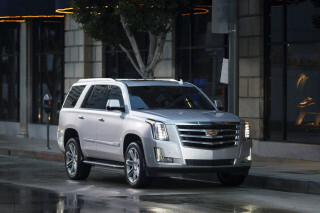 The turbodiesel is the efficiency leader and was rated by the EPA at 23/29/25 mpg after it was approved by regulators. Built our second BMW X5. I had a 2009 before. As my 13 year old stated "Round 2 of trouble." She was right, within 1,week the Instrument Board stopped working a new Instrument board will have to be installed.